BMW has already confirmed that this Roadster concept and the Mini Coupe concept we showed you a few weeks ago will go into production in the near future. We’ll guess that the finished products won’t look radically different from the concepts that are sitting underneath the auto show’s lights. You might be asking — like we are — why on earth does Mini need slightly smaller versions of the current Coopers we all know and love. The answer is not an easy one, but we’d guess these two cars are meant for driving enthusiasts who already covet the Mini’s handling and performance characteristics. These two shorter, lighter cars should be thrilling to drive. Both will likely be powered by only the top engine in the Mini lineup, a turbocharged four-cylinder that’s good for 172 horsepower. Mini’s press release says 175 hp, so we’re not sure if the engines will get a minimal increase across the line or if it’ll strictly be for the new models. Regardless, Mini fans will be ecstatic to have more cars to choose from. 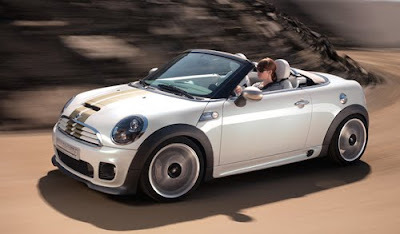 However, most car shoppers are more likely to consider the long-awaited Mini crossover. More photos of the Roadster concept are below. Hello, I am a new friend if you agree, I'm abdellah. Saya menawarkan kerjasama untuk MENGKLIK IKLAN DARI GOOGLE...apa setuju? Really amazing car. And great presentations. I love this car.thanks for sharing!! !